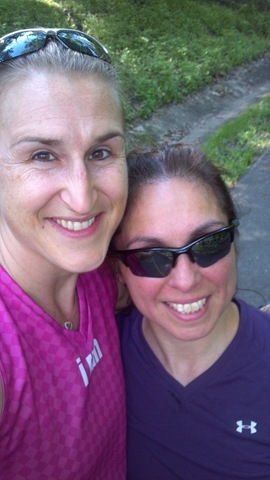 I was a lucky girl and put in some nice miles this weekend while still managing to have lots of fun! The weekend kicked off mid afternoon Friday with a 29 mile bike ride. This was an important ride because I just had my bike readjusted and needed the miles was testing a new pair of sunglasses, the Ryder Shot Photochromic, which had already passed the run test x10. I’ve been running in these glasses for almost a month and we all know from the I Wear My Sunglasses Almost Never post, sunglasses and I normally do not get along. I want to wear them, need them to protect my eyes but usually pitch them due to poor fit, lighting, or the irritation factor. Therefore, I didn’t want to be hasty on writing up a review on the Ryder Shot’s prior to really wearing them, thinking about the fit, coverage, functionality, and using them on both the run and the bike. As a triathlete, the sunglasses are one of the most important pieces of gear on the transition mat. 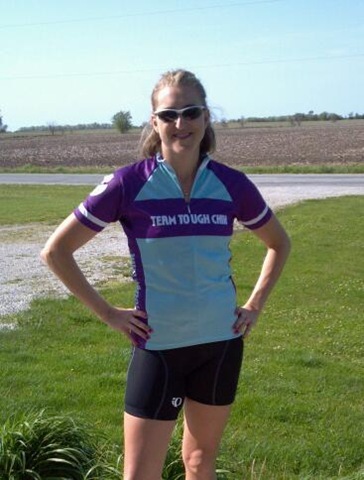 They can make or break the bike/run legs if you don’t own a good pair that fit, perform well and protect your eyes. First, how do they look? The most important aspect, right? Okay, not really but…. The above photo is not the best, it’s a direct result of Aby’s photo session at the bike shop on Thursday night, but it gave me giggles after a quick WTF moment of seeing the color “splashes”. The before/after photos below are a bit better. I’m a “little” disheveled “after” but still smiling! 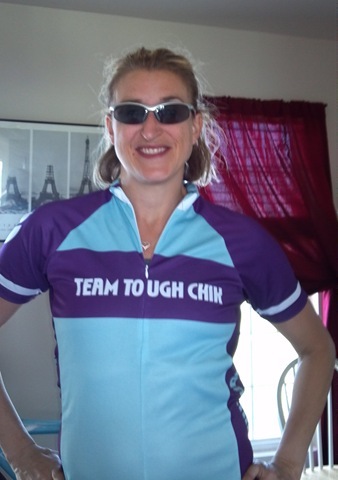 Yes, that is the Team Tough Chik bike jersey if you were wondering. 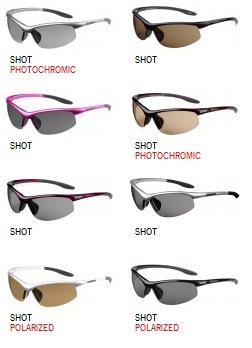 The Ryder Shot’s that I received are the photochromic type which retail for $69. I’m wearing the silver frame with light grey lenses. I probably wouldn’t have picked a silver frame myself, not that I don’t like it, I’m just very boring and tend to stick in the black/brown family. However, these look good and more importantly fit really well. They are not tight on my face but they hug and do NOT move. The Ryder Shot Photochromic incorporates the photochromic technology that automatically lightens and darkens the tint of the lenses according to the weather and lighting conditions. For somebody like me, who is blind doesn’t see well, this is a huge selling factor because I can’t change my lenses while I’m on the road. I need the glasses to accommodate whatever the weather throws at me. The Shot’s come in various colors and styles. The non-photochromic & non-polarized models start at $39, that’s a steal! Initially, upon receipt of these glasses, I was planning to do a list of pros & cons. However, I have put this review off for this long because I can’t find any cons. I wanted to make sure that I was really behind these glasses for the long term before I actually recommend something. I didn’t buy these, that’s a first, so didn’t want to just get all crazy excited over some freebies before I really knew what I thought. I actually like them, really like them, and you will see me wearing them exclusively on the bike and run this season and for many more to come. Thanks, Ryder! According to the Ryder website, these are one of our smallest, most lightweight models. A favorite amongst runners for its minimalist design. I absolutely agree that they are light and certainly not only “a” favorite of mine but the only pair I have used for the last month. 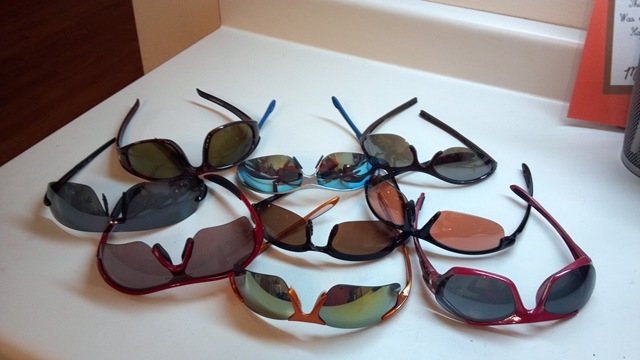 They offer UV protection and are shatter proof. 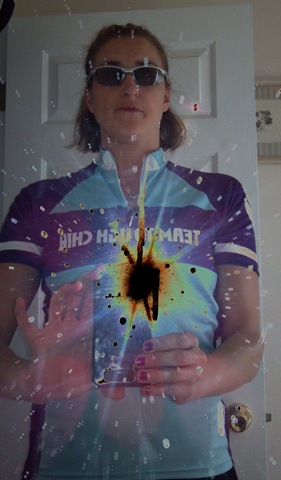 As a triathlete and cyclist, the shatter proof quality is a necessity because things happen and we crash. Although I have never crashed badly enough to crack my glasses, I have seen others who weren’t as lucky. Protective eyewear is not a luxury but a necessity. Please find something to protect your eyes from the UV rays, rain/sleet, bugs and debris. I was wearing these on the bike on Friday and was amazed at the clarity. It was absolutely crystal clear that a yellow jacket would have flown into my right eye had it not bounced off my right lens instead. Scary. Protect your eyes! If you are interested in Ryder products, check out the website HERE. The prices are very reasonable in comparison to other sport brands so enjoy the savings! 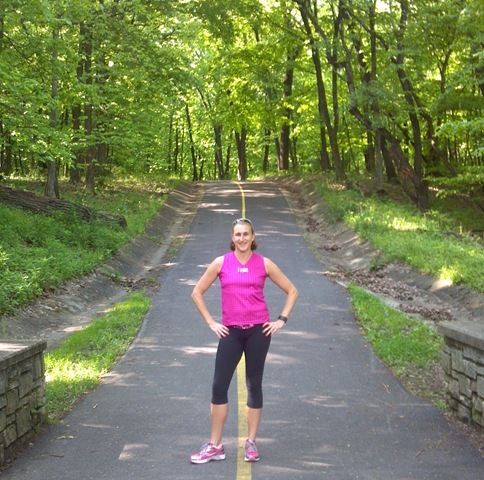 This entry was posted in "Run"Way Fashion, Product Reviews, Running, Triathlon and tagged biking sunglasses, Park Forest Running & Pancake Club, running sunglasses, Ryder Sunglasses, Schubert Woods, Team Tough Chik, Tough Chik, triathlon by tootallfritz. Bookmark the permalink. First off – LOVE your new header photo. Makes me want to come up and run there! Secondly, I LOVE LOVE LOVE my Ryders glasses. I wear the Hex style, but might have to try out the Shots too. Thanks for the review. You look great in them! They sound great and look great!! One question, while running any sunglasses I have worn seem to fog or steam up, from the heat coming off my face,,,,how are these or doesn’t your head have alot of heat….? Thanks! I have worn these for a month solid and that has not been an issue for me. In the past, I have had problems (with other brands) with steaming after I get out of the water from a TRI, and my skin is cool and I put them on for the bike. I haven’t tried these in that situation as of yet but in the past, I have used antifog on the other brand lenses, like I use for my swim goggles. Not sure if it will be an issue with the Ryders. I will certianly keep you updated though if you want.